Tommy Robinson may have once led the far right-wing English Defence League, but the recent very high-profile #FreeTommy online support campaign is far from his homeland of England. Instead, the campaign is being fuelled, funded and driven by the international far right. 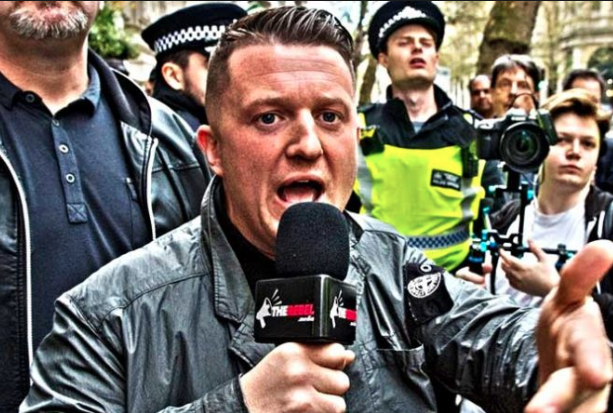 Wired published results after researchers checked half a million tweets using the hashtags #FreeTommy and #FreeTommyRobinson between May 25 and June 11, in the lead up to the June 9 Free Tommy Robinson demonstration in London. Only 40 per cent of the tweets using those hashtags came from UK users while 35 per cent of posts were from the US and the balance from a mix of other countries such as Canada and Australia. Robinson has, as you all know by now, become something of a ’cause célèbre’ for far-right figures also active on social media platforms like Twitter, including Katie Hopkins and Raheem Kassam in the UK, and Mike Cernovich and Alex Jones of Infowars in the US. Wired also reported that the 17,000 accounts that have used the three main ‘freeTommy’ hashtags are far more likely to follow US-based right-wing Twitter feeds than UK based ones. Hope Not Hate also analysed 61,000 signatures on a Change.org petition created at the time of Robinson’s arrest. Only 68.1 per cent of the signatures were from the UK. If any foreign organisation got caught meddling in the political affairs of the United States to such as extent there would undoubtedly be consequences. One only has to look towards the Russia-phobic paranoia sweeping across the USA to understand that. In the meantime, there are those profiting from all this political mayhem. Take Change.org for instance. It is a multimillion-dollar for-profit private company, not a nonprofit public charity as many falsely assume. The company began as a nonprofit that connected charities to donors, but has transitioned into a for-profit company that makes money by selling advertised petitions on its website. The ‘world’s platform for change’ is the way they like to describe themselves. Clearly, in the case of a far-right extremist like Tommy Robinson change.org are happy to break all their own rules as long as they can make a few bucks. Over 630,000 people signed its “Theresa May MP: Free Tommy Robinson” petition. It has produced tens of thousands of pounds for the Silicon Valley hipsters who have taken full advantage of the situation to line their own pockets. “Tommy Robinson has been arrested and jailed for reporting on Muslim grooming gangs. A job that he chooses to do with no regard for his own safety, informing the public of all the wrongs committed in the name of Allah. Fighting against adversity and reporting on issues that our mainstream media are too afraid to speak of. Its time we stand together, stand strong and stand by his side. Leaving aside the fact that Robinson was jailed for breaking a court order of the type imposed by judges to protect fair trials, Robinson or his followers can hardly claim he is the sole reporter of all the wrongs made in the name of Islam. When considering the headlines of the Daily Mail, Express and Telegraph this is a ridiculous assertion. As for the grooming gangs, even the MSM have been reporting on it non stop. The Times of London has extended many column inches to this story, let alone the anti-Muslim rantings of the aforementioned. No, there’s a reason why Change.org didn’t stick to its own guidelines ban on petitions that “attack or malign an entire class of people because of their religion.” They were making a stack of cash out of it at the expense of others. As PrivateEye reports: “the real goldmine for the company is the signatories’ personal data, which it can sell on to paying sponsors. It tells users: “We display advertising in the form of sponsored petitions, which are similar to sponsored videos on YouTube, sponsored links on Google, or sponsored tweets on Twitter.” The Italian magazine L’Espresso published a price list showing that Change.org charges “€1.50 per email if a client buys less than 10,000, up to €0.85 per email if the number goes above 500,000”. Change.org’s business practices and potentially deceptive branding have led to criticism from all sides of the political spectrum. In the meantime, who buys all the data of the very people who signed and donated to that petition. It won’t be Mothercare or Finish dishwasher power tabs with a hint of citrus, will it? It’ll be the same organisations whose intentions are to feed more right-wing messages in order to push their own agenda.